The time has come, a horse trailer is in your future. You’re ready to start shopping but you aren’t sure what you need and before long, you’re overwhelmed by all the choices. Slant or straight load, tack storage, hitch styles… and that’s before you consider living quarters. We’re here to help! This guide will walk you through the first basic trailer decisions. And if you still have questions our knowledgeable staff is always here for you. They know horse trailers inside and out! Let’s begin at the beginning. 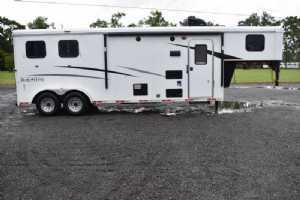 Do you need a bumper pull or gooseneck horse trailer? This is one of the first questions I ask when folks call. 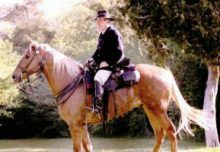 If you’re new to hauling horses you may not know! Bumper Pull Trailers are hitched to the back of the towing vehicle. Gooseneck Trailers are hitched in the bed of a pickup truck. Which is right for you depends on your tow vehicle and how many horses you want to haul. A bumper pull trailer can be towed by just about any vehicle with enough power and towing capacity to manage the weight. 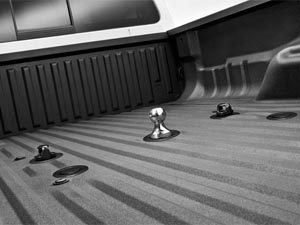 And many heavy-duty SUVs and pick-ups come with a good hitch installed at the factory. Most bumper pull trailers will only carry two horses. Goosenecks require a truck (a pick-up will do) and a special hitch mounted in the bed. But you can haul a lot more horses with better stability and a smaller turning radius. One of the next things I ask customers is whether they want a new or used trailer. Sometimes they want to know the benefits of each. A New Horse Trailer sure is fun! 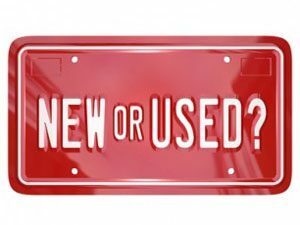 You get a full factory warranty and that “new car smell.” A new trailer may be just the ticket if you don’t plan to upgrade in the near future. And if you’re financing, rates will be a bit lower. 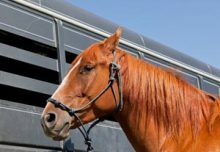 A Used Horse Trailer could be a better fit if you might upgrade in a few years and if the “new car smell” isn’t so important to you. Sometimes, used trailers have nice options that were installed by the original owner, too! Extended warranties are available at a reasonable price. Next we need to know if you want a slant load, straight load, or a less common option, box stalls. 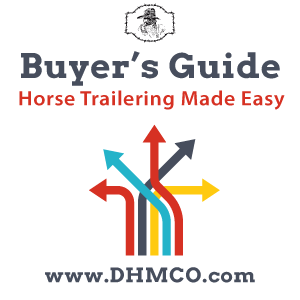 There are lots of opinions but don’t ever forget the #1 rule of horse trailers: Whatever you feel most comfortable loading and pulling is what you need to buy! Straight Load Horse Trailers (also called side-by-side trailers) are usually seen in two horse bumper pull models. The horses load facing the front of the trailer and stand side by side. 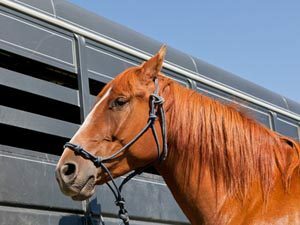 Most straight load trailers offer your horse a little more space and make sense for larger horses. Slant Load Horse Trailers are the most popular. The horses load and travel with their heads toward one side of the trailer and their rumps to the other. Because it’s more efficient, you can fit more horses in a smaller trailer. And while every horse and trailer is different, some folks think the bigger opening of a slant load makes horses easier to load. Box Stalls are a style you won’t see too often. These trailers have open “boxes” separated by partitions, much like box stalls in a barn. These words describe the walls of the trailer. 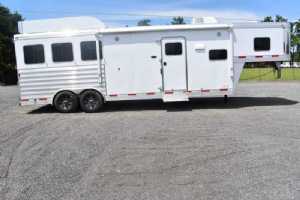 Fully Enclosed Trailers have full walls on both sides, with windows at the head and rump of the horses. 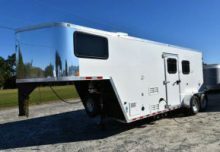 These trailers are purpose-built for horses and have endless options and configurations. 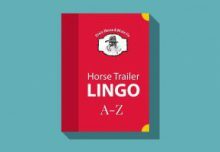 Open Side, Stock Side, or Stock Combo are all names for horse trailers that have slats or air spaces along both sides, at about head height, above a solid wall. These spaces are cutouts in the wall and don’t open or close like windows. Stock trailers may be a little more rugged and sometimes cost less than enclosed trailers. Do you need a dressing room, tack compartment, or a horse trailer with living quarters? Maybe you just need to haul horses… but there are trailers that can do double – or triple – duty! If you’re making day trips, competing, or just want a private place to change after a day of trail riding, it’s nice to have a comfortable changing room of your own. And it’s always as close as your trailer! A dressing room is also great for hauling supplies. It may be called a dressing room but you can use it for anything you want! Hauling saddles? Tack storage in your trailer will keep them safe, clean, and dry. If you get tired of packing and unpacking, like the idea of driving past motels, or just want to be closer to your horses, living quarters may be for you! In the horse trailer business we call them “LQ,” and they give you a place to cook, bathe, and sleep. It’s mighty convenient!